If there is one thing Rangers fans know for sure –It ain’t what you don’t know that gets you into trouble. 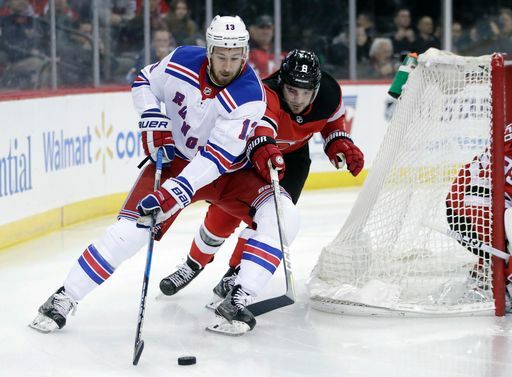 It’s what you know for sure that just ain’t so.– it’s that Kevin Hayes will be traded this season. Signed to a one-year deal that brings him to 27 years old and peak UFA freedom, the writing appears to be on the wall for Hayes that he will be traded. The Rangers are rebuilding, have great center prospects, and Hayes can feasibly fetch a boatload. Trade value can be a fickle thing though. Hayes is likely a pure rental for any acquiring team, thus the timing of a trade may impact his value. In theory, the sooner the Rangers trade him, the more value they get since the acquiring team has him for more games. That makes sense in theory, but I’m unsure how that impacts true trade value, since we aren’t talking about a full season anymore. We may be talking about two-thirds of a season, or less. Looking at the trades from last season, there aren’t many trades that involved players comparable to Hayes. The Matt Duchene three-team deal comes to mind. The Senators landed Duchene and it cost them essentially Kyle Turris, a good prospect (Shane Bowers), their 2018 (now 2019) 1st round pick, and a 2018 3rd round pick. It’s a three team deal so it’s tough to really look at this in a vacuum, but that’s basically what Ottawa gave up. The only trade that strikes me as a comparable is the Paul Stastny trade to Winnipeg. The Blues landed a first round pick and Erik Foley, a pretty decent prospect. Foley was a third round pick that seemed to progress nicely with Providence College. He’s been on season opening IR this year. If I’m Jeff Gorton, that’s probably the opening price for Hayes. It’s consistent with what has been the norm for a few years now. A top pick and a good prospect. Interestingly enough, Winnipeg has been rumored to be a good fit in Winnipeg. They have a good amount of prospects and are in win-now mode. That’s just one team, and there are a ton that can use a 2C like Hayes. But to the original question: Does trading Hayes now add value to a deal? I don’t think it will. The market is pretty set when teams are acquiring pure rentals. "Looking into Kevin Hayes' potential trade value", 5 out of 5 based on 4 ratings. I think you do not actively shop Hayes. Let somebody overwhelm you. If that happens, pull the trigger, otherwise he plays a strong role on this team. Now, at the trade deadline, we may be 10 points out of a wildcard. Then you move him. We may be in the thick of the wild card race. What do you do then? I think an awful lot depends on the growth of Howden, Chytil and Andersson. These young players need to show they are at a 2C level in the NHL. If they are, then you move them, if not, then Hayes needs to be ion longer term plans. I agree, there’s ZERO reason why the Rangers should be actively looking to trade anyone right now — unless we’re talking about a marginal player or a player whose value over the course of the season is more likely to decrease than increase based on the depth chart. Of the 3 players you listed, I would say Howden stands the best shot at moving into a 2C role this season … down the line he may be surpassed by Chytil, but not now and I have no issue with Chytil playing on the wing — for now. Andersson could slot in on the 3rd line — but don’t mistake that comment as a statement of his “ceiling” as a player. In the final analysis though I would prefer to keep Hayes around for the next couple of years and look to trade players who aren’t really in the mix — like Namestnikov, Smith and Spooner, maybe Zucc just because of his age … and Shattenkirk if he doesn’t wake up by the trade deadline (assuming Pionk and ADA continue to improve). If McQuaid can net us a 3rd rounder at the trade deadline, do it. I don’t understand this let’s trade everyone away philosophy. I am with you, Hayes is a solid player and at 27 a good player to keep around. The only knock I have on him is his asking price. If Kevin and the club can work out a deal that they both can live with, then ink him. “These young players need to show they are at a 2C level in the NHL.” There were way to many folks around here who ASSUMED that Lias and Chytil would be given spots. I couldn’t even fathom a conversation with them once they assumed that he would either be traded or played as a 3c. It’s a shame we couldn’t have constructive convo’s on here over the summer about the center jam up. Yeah they’re clearly not doing that. I think it’s safe to say assume how after last seasons deadline and draft came and left without trade. The fact that the President, GM and the coach had public discussions of telling the hockey world that they want and expect Hayes here long term helps. Brooks seemed adamant in his column today that Hayes would not be traded. It appears that a sign and trade, which avoids the “rental” aspect, would be impossible cause I think Hayes will be insisting on some type of NMC. Not sure why Brooks feels that way, but something has to eventually give way with the center glut. I think Gorton signs Hayes if he can avoid giving him the NMC/NTC. NYR control their own news like any mainstream place unless it’s some juice gossip for cheap clicks. Actually this is Brooks second column since November, showing the fan base his ” adamant ” ways by saying that Hayes is most likely sticking around long term. A few days later he put something out about how now is the time to trade off their assets like Hayes. ( Shocker ) that some people bit on that and used that as a source for the near future. As you see that’s just not going to happen and now Brooks will look like ” the man ” after they resign Hayes. He needed some clicks and something for people like Dave to rewrite about that. I’m going to say that Hayes would take a pay cut for a NMC which imo he’ll get. Quinn would want him here in the long run and Hayes strikes me as a confident individual who would think that he can get paid again when he’s 31-32 yrs of age. Saw the metrics on the other BSB and Hayes has been good this year, stats seem to prove it. However, your Bromance with Hayes aside, Hayes is not the difference-maker that ultimately should block the young guys, especially at an inflated salary. If and only IF we can get a decent and substantial return on a trade he should go. “If and only IF we can get a decent and substantial return on a trade he should go.” Smart, throwing shi# at the wall hoping it sticks, you learned well from Brooks. I believe it always takes the right return for a GM to make a trade unless if it involved Stepan lol. Bomance? I get that I’m one of the few if any at all who sees his worth on this site. I just stick out like a sore thumb but I do own it. My experience with people who have the word cat in their screename usually wear sweatshirts printed with a giant kitty on it. They also draw tons of pictures of them, have 5-6 laying around them and even eats cat food when their bored. I remember only one person that actually walked away from his Ranger contract and retired. Naslund? I thought that was a very classy and honorable move he made, when all other athletes stay way too long to collect a paycheck. I am thinking Bait and switch may work better here, trade Zib and sign Hayes. I think Hayes will have a bigger cap hit than Zib on a longer term deal, but Hayes is a better 5 on 5 player and ZIb has better percieved value and with a reasonable contract in place, that could amp up the return. Realistically it’s hard to see Zib or Hayes with The Rangers when we are truly competitive again, but stranger things have happened. Winnpeg makes sense. Hayes’ age Vs. the age of this new team will be the reason he plays for another club next season. Even Winnipeg doesn’t want to live in Winnipeg. im not entirely opposed to keep hayes around but it has to be well thought out and solid returns on guys like names and zuc. perhaps you look to deal zib before his nmc kicks in . by then they’ll know the draft order. I would not trade Zib. I do not want to give Hayes a 5 to 6 million per deal for anything more than another season or two. We have the youth, let’s go with that and continue to stockpile picks and prospects since we are allegedly committed to a rebuild.